I recently returned from my first Hispanicize experience. Hispanicize, the largest annual event for Latino trendsetters and newsmakers in social media, journalism, advertising, PR, film, music and innovation, has emerged as THE place to be for marketers and I was able to experience it all as a first-time attendee. There were so many people to meet, brands to experience, panels to attend, experts to learn from, and, of course, so much entertainment to enjoy. Knowledge is Power: Through empowering voices like Yoani Sanchez’s, a Cuban human rights activist, I was able to learn that courage and passion is essential when you are trying to make a difference. She emphasized that information – available with the help of technology – is one of the most powerful tools a person can have when they want to change the world. As she herself said “I believe in the force for change that is information”. 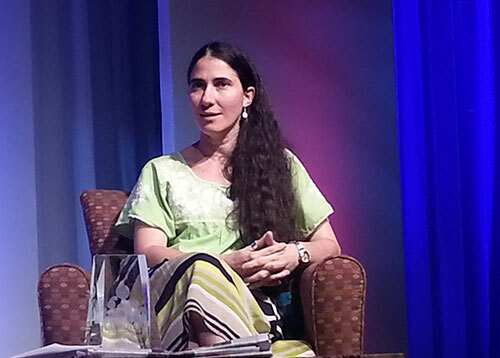 Yoani Sanchez, Cuban human rights activist, blogger and entrepreneur, received the Latinovator Award during Hispananize for her remarkable achievements. Credit: Hispanicize. Outstand by Understanding: Creating a memorable brand experience at Hispanicize is key to building a connection with influential Hispanic gatekeepers. A mix of creativity, execution and a good campaign (or product) is what made these three brands stand out for me: Coca Cola, who unveiled their World Cup program through a combination of a panel, luncheon and large exhibit space and who even brought famous singer Carlos Vives to speak about his experience recording Coca Cola’s song with David Correy; Target, who organized a fashion show to present their summer collection; and Google, who offered a sneak peak of a new domain called .Soy (.I Am) targeted to Latinos. Adapt to the New Era: For younger Hispanics, Spanish language media is becoming the alternative, rather than the main source when it comes to news and entertainment. This has resulted in the emergence of new media spaces tailored towards the Millennial consumer (like Fusion) and in the evolution of some of the existing ones. During the unveiling of the State of Hispanic Journalists Report, the president of the National Association of Hispanic Journalists, Hugo Balta, said: “You are either going to lead change or change is going to lead you.” Demographic shifts, changes in language and the modernization of culture are shaping the industry. The 75-25 Rule: According to Lance Rios, Founder of Being Latino and Digibunch, in order for brands to have a successful Facebook page when targeting Hispanics, they should dedicate 75 percent of the content to entertainment and the remaining 25 percent to marketing purposes – and even in that 25 percent of content that focuses on brand messaging, it’s important to include an entertainment component. Dare to Evolve: We live in an era where consumers are telling marketers what they expect from brands. It now depends on us as marketers to hone in on those engagement drivers in order to connect with consumers through marketing programs that MUST have a social media component in order to drive a two-way conversation. The growth of an event like Hispanicize, which started just five years ago, is proof that as a community we warrant dedicated investment, special attention and cultural understanding when it comes from brands and large companies. I left Miami with a stronger sense of pride for being part of a culture that is making a difference, especially in this pivotal moment in history for Latinos.